Cozy Dearfoams slippers, three ways! Some aspects of blogging really have me pinching myself. 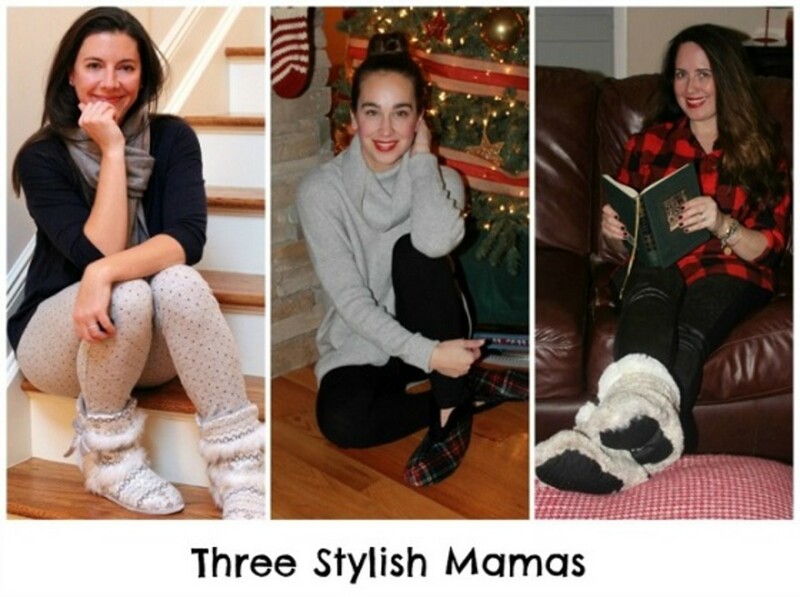 In the latest installment of Three Stylish Mamas, Kristin, Carly, and I partnered with men&apos;s and women&apos;s slipper maker, Dearfoams. It&apos;s hard to be warm, comfortable, and stylish throughout the winter season but a pretty pair of cozy house slippers help achieve all three. I&apos;d been meaning to buy some new slippers since we still don&apos;t have a lot of rugs in the new house and the wood floors get really cold. I&apos;ve always been a "barefoot" person but a big, drafty house screams "fluffy footwear!" I found myself gravitating towards the fun prints and faux fur slippers. Now when I get home, I immediately slip into my scuffs, ballerinas, or boots and lounge in style! I even found the perfect, terry open-toe pair for just out of the shower. Shopping Dearfoam&apos;s collection of boots & booties, open toe & thongs, clogs, moccasins, and scuffs was fun and easy and I picked up quite a few gift ideas as well. Slippers always make a great holiday gift! Click here and here to see Kristin and Carly&apos;s picks. One Grand Prize winner will receive an all-expenses paid trip for two to Aspen, Colorado! Ten first runners-up will each win a $100 gift card toward a spa session. 20 second runners-up will win a pair of slippers from Dearfoams’ new Chalet Collection. To enter the sweepstakes, complete the entry form at Dearfoams.com or Dearfoams Facebook page, follow Dearfoams on Pinterest, and pin a few of your "favorite things” that bring comfort or joy. Check out the Dearfoams’ Comfort & Joy board for inspiration!